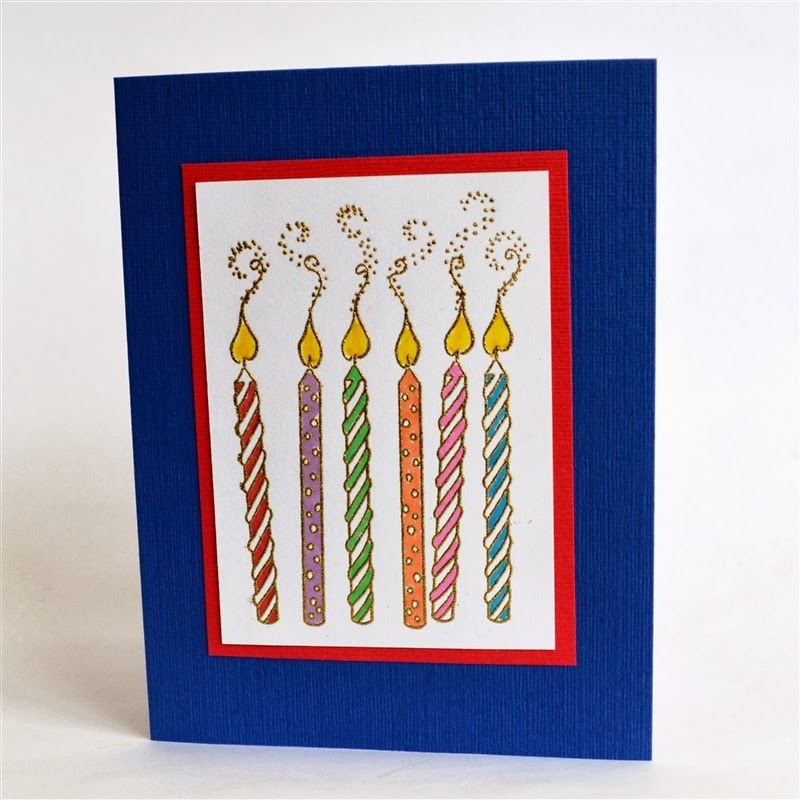 When you make cards, people generally expect a hand made card from you for all occasions. 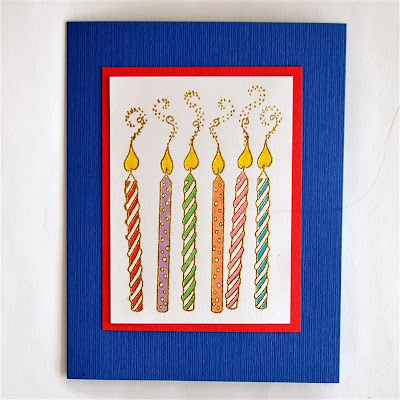 It is a good idea to have a stock of birthday cards on hand so you will always be ready to celebrate even if you can't make a personalized card. Our nephew has a birthday in between Thanksgiving and Christmas and this year I made his card as a prototype for a "generic" card that could be used for just about anyone. I have started to get back to coloring stamped images. It is very relaxing to do some coloring and just let your mind wander. It is even easier if you heat emboss the stamped design. This gives you a tiny ridge to help you stay in the lines. This stamp is from Great Impressions and was the stamp of the month in December at my local shop Ink About It. They always have a half price stamp for the month and I usually can't resist buying it! I stamped the image with Versamark ink and heat embossed the image with gold fine detail embossing powder from Ranger. After I colored the image with ProMarkers, I trimmed the cardstock to a rectangle just a little bigger than the finished image. Then I matted it with red cardstock and centered the design on an A2 card. 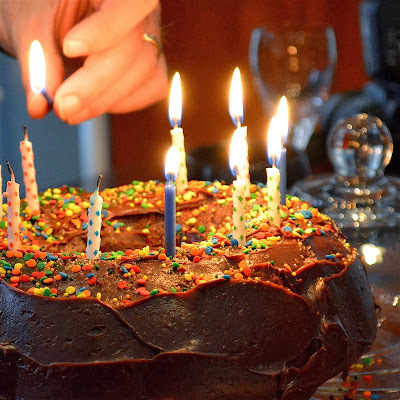 When I saw the candles on his cake, I realized that the dotted ones matched the stamped image on the card - a lucky coincidence! 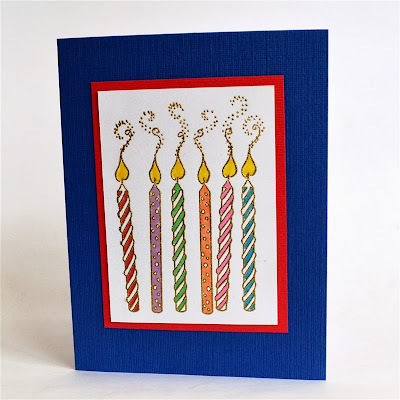 I added a white liner to the blue card base and stamped the "Celebrate" circle image and the "Happy Birthday" sentiment with the Close To My Heart Perfect Fit - Birthday stamp set (B1417 - click HERE to see the full set). I cut the stamp to place the "Happy" above the "Birthday" to fit my card more neatly. I like to make a holder for cash or a gift card inside the front of the card to keep them from falling out when the card is opened. I cut a piece of red cardstock to 3 3/4 inches wide by about 2 1/2 inches and punched the top edge with the border punch from the Martha Stewart Punch Around the Page Cathedral Lace Set. Scor-Tape works very well to hold the pocket to the card securely. 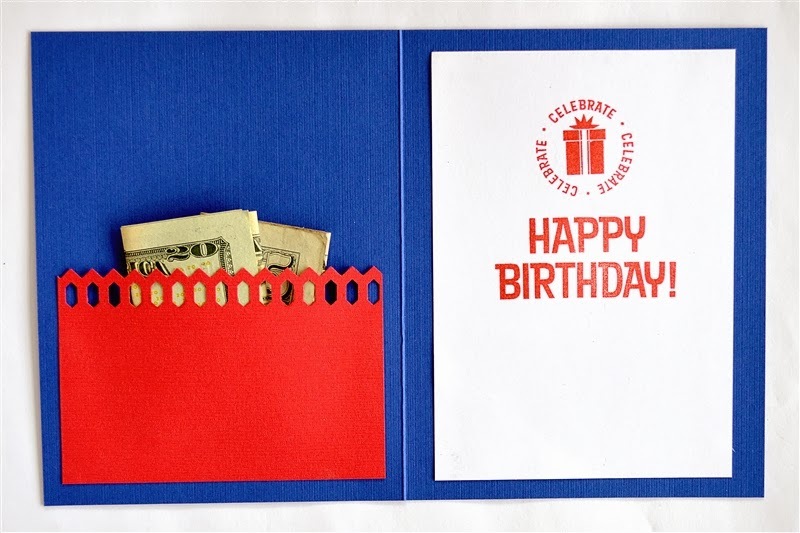 Just remember to leave the punched side open so you can fit the cash or card inside! 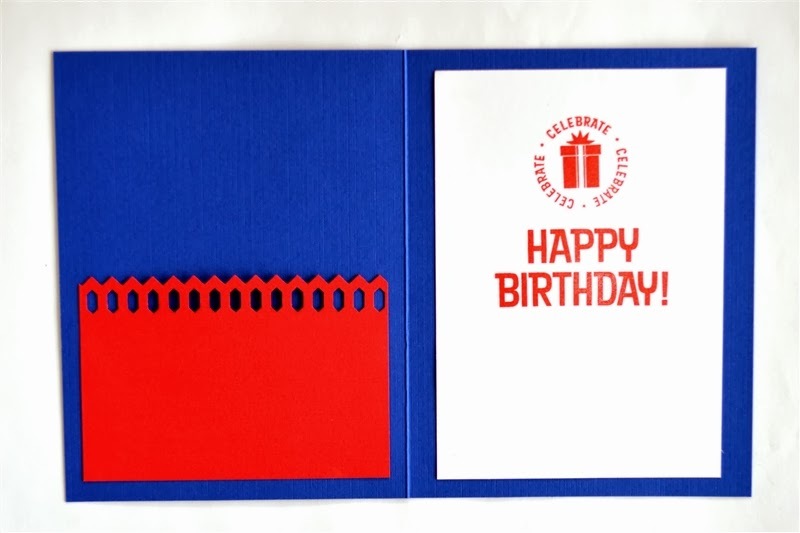 Do you make up "generic" cards ahead of time or do you prefer to create each card as a custom fit for the recipient? 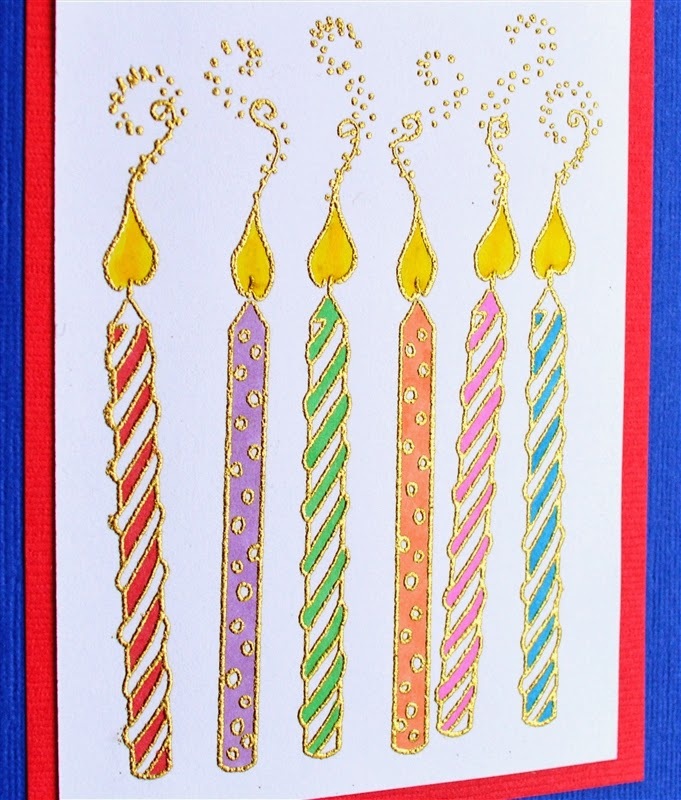 I usually make cards that are personalized but I think I will make a few more like this one to be prepared for those birthdays that "sneak up" on you. It is snowing here and lots of schools in the area (including those in our town) are cancelled. I am sure the kids won't mind a few extra days of vacation. Stay safe and warm if you are in the path of this storm. What a pretty card. Like you I like to make personalized cards, but don't always have the time or the memory to have one in time. When I come across an idea I like then I try to make up a few extras to have on hand. That plan has saved me so many times.